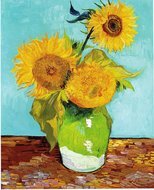 One of his earlier attempts with sunflowers, Van Gogh used the experience from this painting to create numerous other sunflower paintings in oil. The series became synonymous with the artist. Our artists have studied advanced techniques that Van Gogh has incorporated into his original work. Our aim is to spread and celebrate one of Holland’s most famous artists, and to ensure that his legacy lives on for many more years. In late 1888, Van Gogh began painting a series of sunflower paintings, under the influence that he needed to create a series that identified himself with the work, such as Jeannin with the peony flower, and Quost with the hollyhock. He eventually settled on the sunflower, and began painting a number of paintings. He originally began his series in Paris, and continued his work as he moved to Arles. In his endless quest for bettering his craft, Van Gogh constantly searched for subjects and landscapes that would challenge him. During this search, he felt that as an artist, he needed a set of paintings that would identify him from the rest of the crowd. His search for a muse led him to look to nature, where he found the sunflower to be a perfect subject for a series of his future paintings. 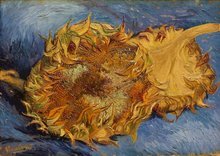 The bright and vivid tones of the sunflower were perfect, and blended in seamlessly with the impressionist and colourful imageries that he wanted to invoke. 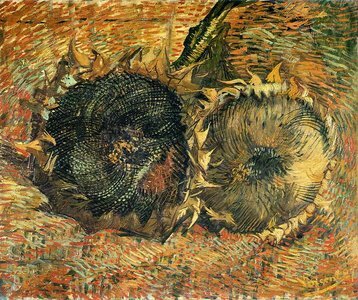 So, during his stay in Paris, he started work on his sunflowers, initially leaving them as the sole subjects. As he moved to Arles, he tried capturing sunflowers in a vase, in order to get a different perspective of the subject. All of his efforts would prove fruitful, since this series eventually became the very identity of Van Gogh’s artistic career. Adding splendor to your room requires a touch of the heavens, which can be gotten from a meticulously crafted oil painting. Get this heavenly painting in your home or office and you can be rest assured that it will leave an indelible mark on the soul of anyone that sees it.